The Northern Oregon Coast is quintessential Pacific Northwest with miles of rugged and rocky coastal headlands with quant towns scattered throughout. Here you can hike through fern covered forests with spectacular waterfalls or walk on secluded beaches and explore sea caves. 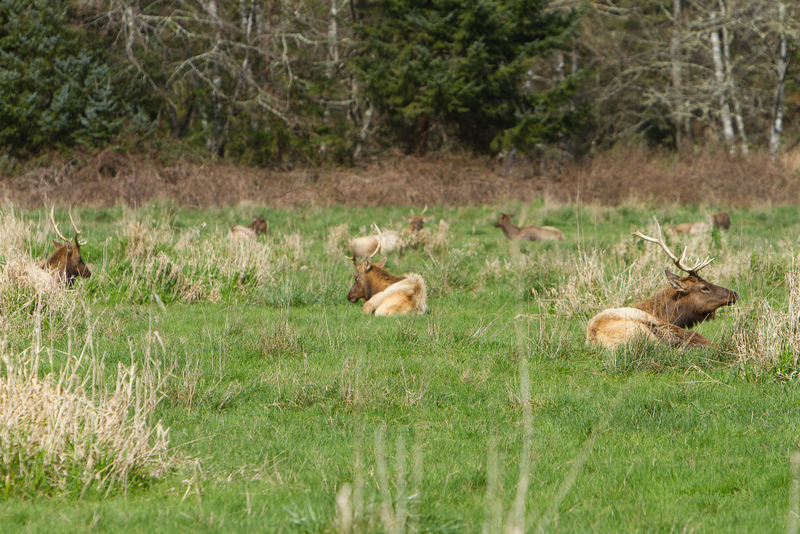 Its not uncommon to spot a heard of Roosevelt Elk lounging in an open meadow along this section of coast. The options for camping are very good at the many State Parks along the way however if you plan to go in the heart of the summer, make sure to book campsites ahead of time. This loop can be done in as few as 3 days but we recommend that you spend more time to settle in and properly explore the area. This guide is meant to give you some of the highlights of the route, there are many more wonderful towns, restaurants, and beaches that we do not have the space to mention and will leave for you to discover. You can do the loop in either direction however we recommend starting in Astoria and driving south. Astoria is only an hour and a half drive from Portland. This is the spot where Lewis and Clark finally reached the Pacific in 1806 after the nations first cross county expedition to explore the west. A few years later the settlement of Astoria was founded by John Jacob Astor with his sites set on the lucrative Pacific Northwest fir trade. If you are up for a good book about the history of the area we highly recommend picking up “Astoria” by Peter Stark for a very interesting piece of history. Centuries later Astoria became famous for being the setting for the 80’s movie the Goonies. Make sure to take time to walk around this historic small town and waterfront to soak up its charm. The town once had a thriving cannery district that is now being repurposed into thriving businesses. 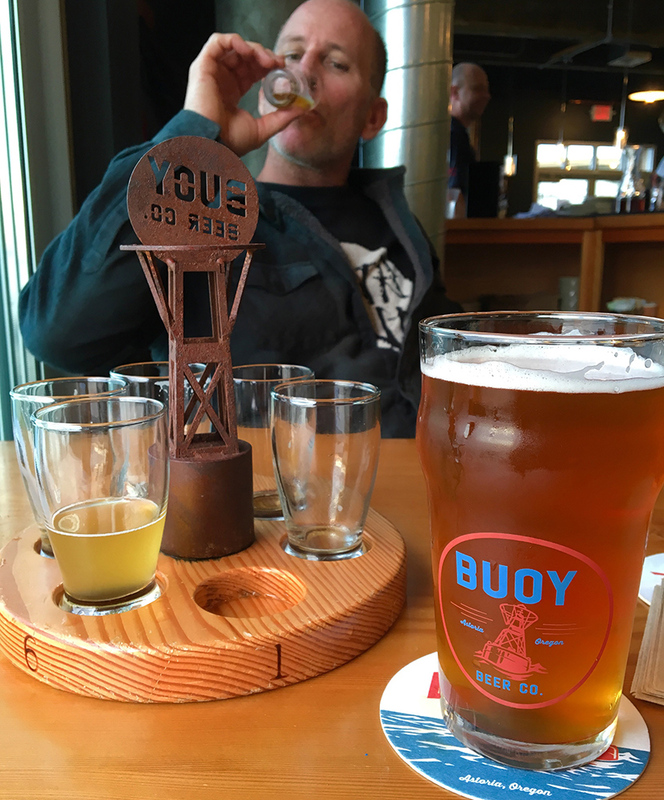 If you like beer you are in luck as there are two amazing breweries to visit, Buoy and Fort George, both offering up good food as well. If you are in the mood for fish and chips head over to the Bow Picker across from the Maritime museum for some fresh caught albacore. Fort Clatsop National Park located just outside of town features the re-created camp that Lewis and Clark built to stay during the winter of 1805 after their 2,000 mile journey. Another site to see in this area is the picturesque Peter Iredale shipwreck, an old iron skeleton hull of a sailing ship that rests on the beach at Fort Stevens State Park. Also within the park you can view the Columbia River Bar and the 6.5 mile long south jetty that juts out into the Pacific. Fort Stevens State Park is a great place to camp and has 470 camp sites scattered throughout the forest. We also highly recommend Cape Disappointment State Park, located across the Columbia in Washington with 215 camp sites. 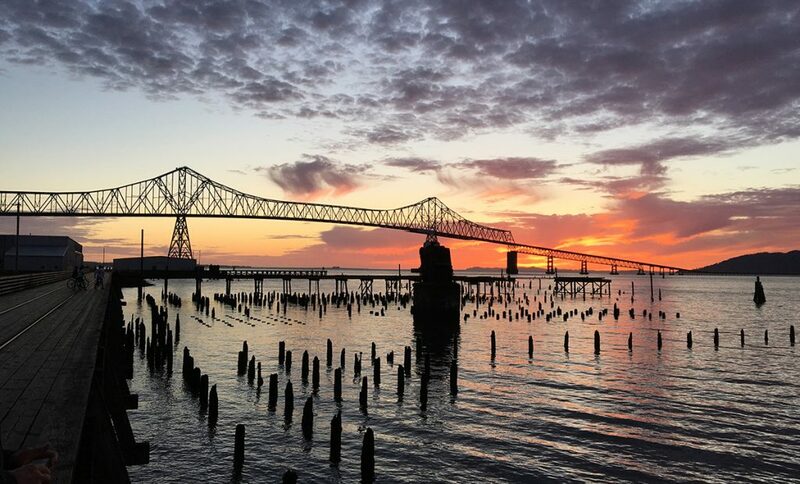 Long Beach is a great side trip and is located just north of Astoria across the 4 mile long Astoria-Megler bridge. Here you will find a seven mile stretch of flat sand where vehicles are permitted to drive out on the beach. Bring a lunch, take a nap, but make sure to be extra careful of not getting the van stuck in soft sand. Cannon Beach Is a very popular tourist town offering a plethora of restaurants and shopping options. The photogenic Haystack Rock is the feature that makes this town famous and is accessible by foot when the tide is out. If you are visiting in June don’t miss the annual Cannon Beach Sandcastle Contest where master sand shapers sculpt amazing 3-D art in the fine beige beach sand. If you are stopping here for the night there are a couple options for camping. 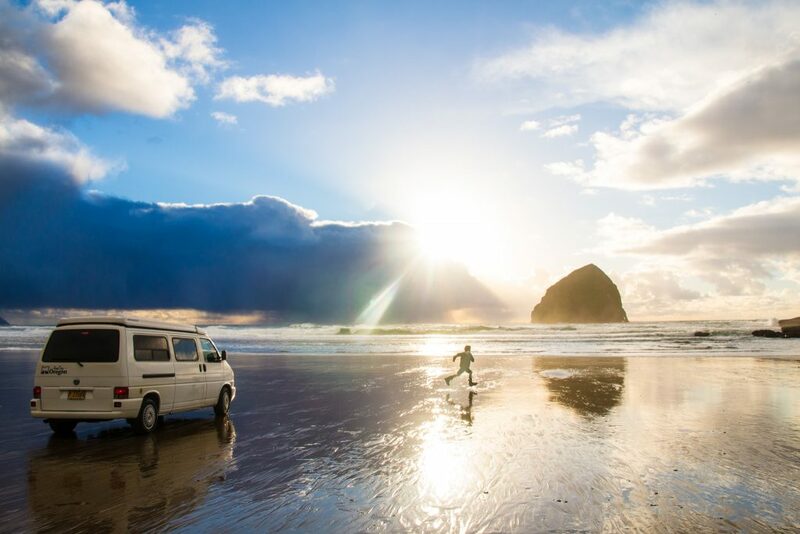 Wrights for camping is a small campground with 20 sites and close by is the RV resort at Cannon Beach with 100 full service sites. There are some great hikes near Cannon that offer epic vantage points. 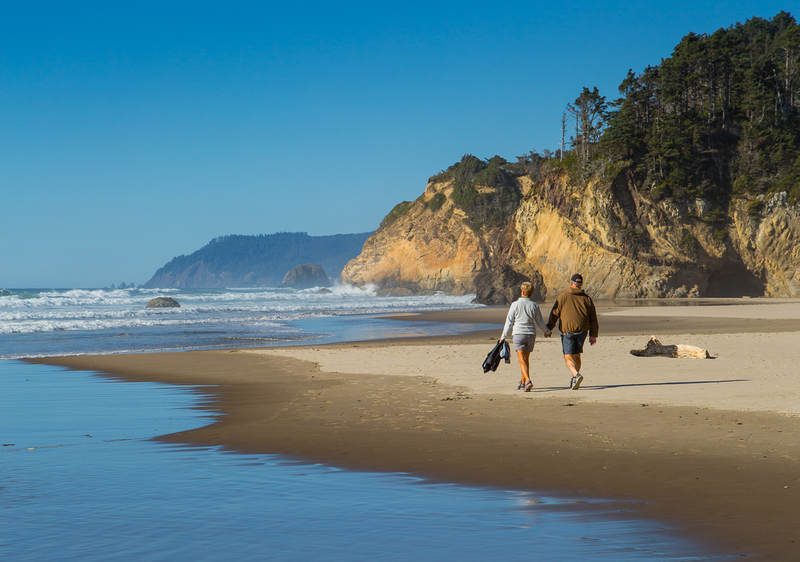 We recommend checking out Ecola State Park situated just north of town. This park offers a beautiful drive thru an old growth forest, a possible elk encounter, epic coastline views and a secluded beach, great for hiking or surfing. As you head south out of Cannon Beach make sure to take your time and stop at a few of our favorite spots along this section of coast. Hug point is a scenic beach with sea caves to explore at low tide. In Oswald West state park, take the trail through old growth forest to reach short sands beach, a classic Pacific Northwest beach. If you are up for a longer hike take the trail out for some amazing views at Cape Falcon or Neah-kah-nie Mountain. 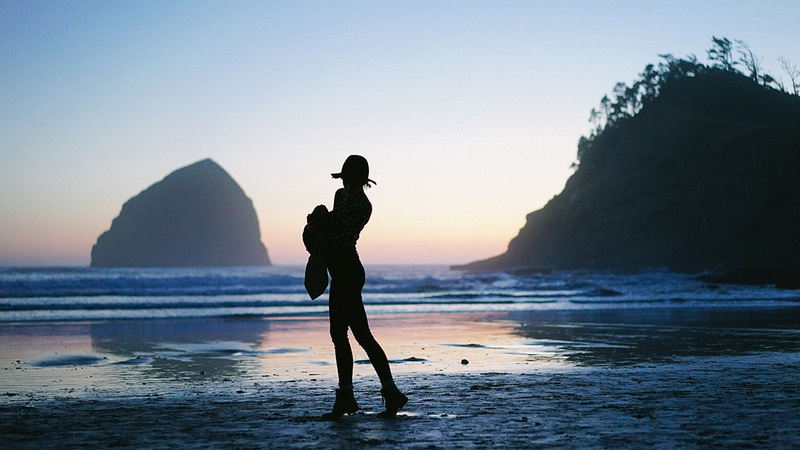 Manzanita is a great little town that we like to call the laid back little sister to Cannon Beach. This town is worth a stroll around and has some nice cafes to grab a bite to eat. The town has great beach side parking and is a perfect place to park the van, open the side door and take a nap with the sound of the waves and the ocean breeze blowing in. 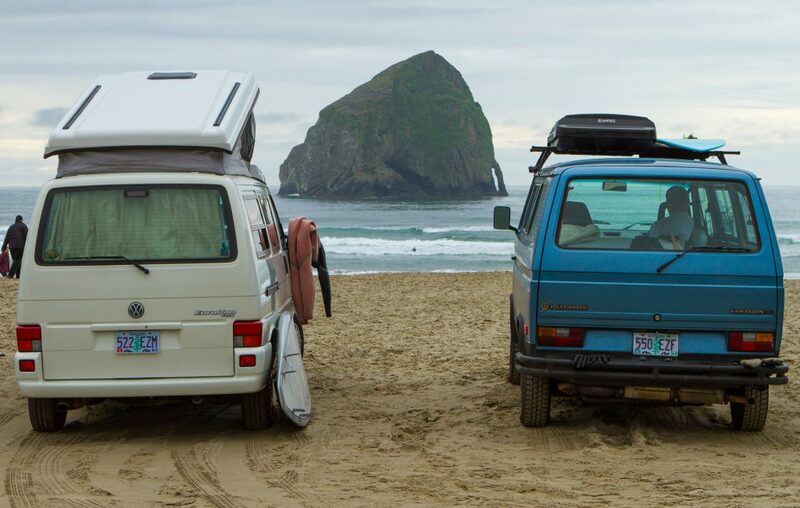 If you are looking to camp nearby, Nehalem bay state park offers 265 sites set amongst a sea of shore pine and borders rolling dunes along the beach. If this campground is full, head down the road to Barview Jetty campground which offers 347 sites set in the forest. The next major town you will hit driving south is Tillamook. Tillamook is primarily farmland and is known for its dairy farms. We recommend stopping for ice cream at the Tillamook Cheese Factory, or the Blue Heron French Cheese Co. for a more sophisticated tasting experience. Another site to see is the Tillamook Air Museum set in an impressive timber frame world war II blimp hanger. 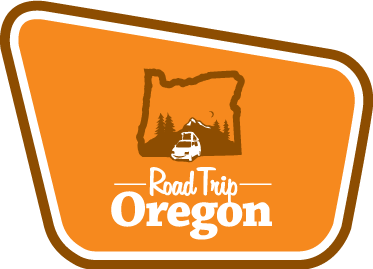 Tillamook is also great place to stop for supplies, should you need them to continue your adventure. A little further south, Cape Lookout State Park is located on a sand spit between Netarts Bay and the ocean. Here you will get a terrific view of the ocean with easy access to the beach for beach combing. There is also a nice campground here offering 208 sites, all located within walking distance to the beach. Pacific City is where you will want to taking extra time to spend at the scenic Cape Kwanda. You can pull your van right down on the beach (use caution in soft sand) and enjoy amazing views of the other Haystack rock. 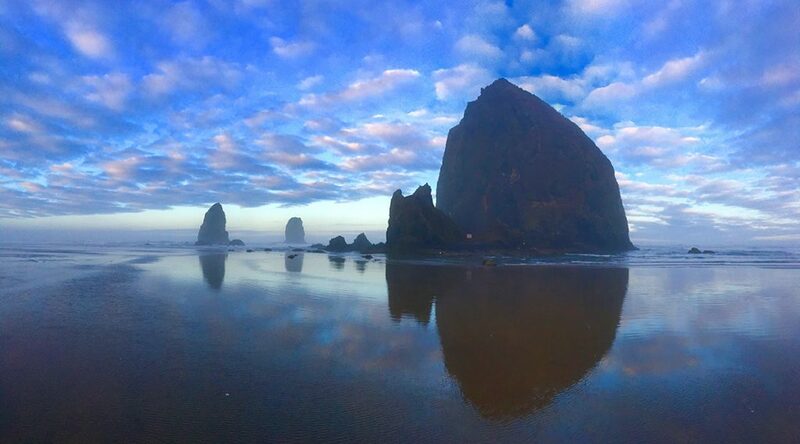 There are actually three basalt sea stacks referred to as Haystack Rock on the Oregon coast. 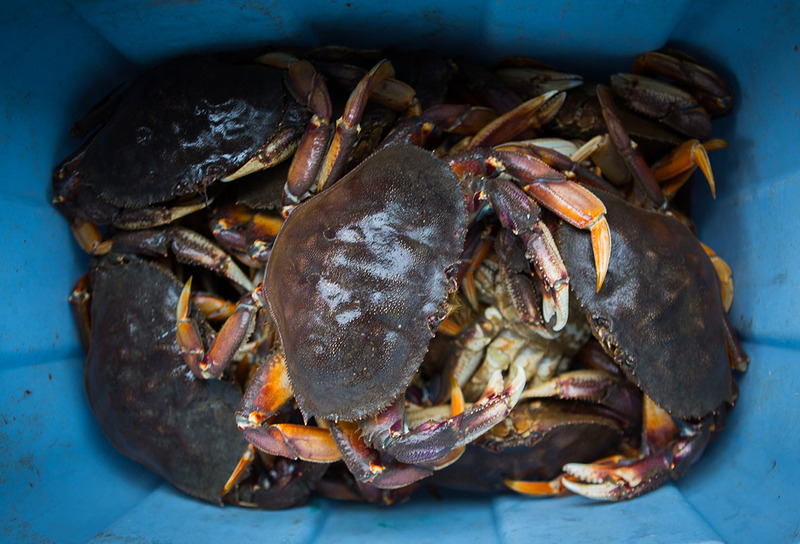 They’re located in Lincoln City, Pacific City and Cannon Beach. 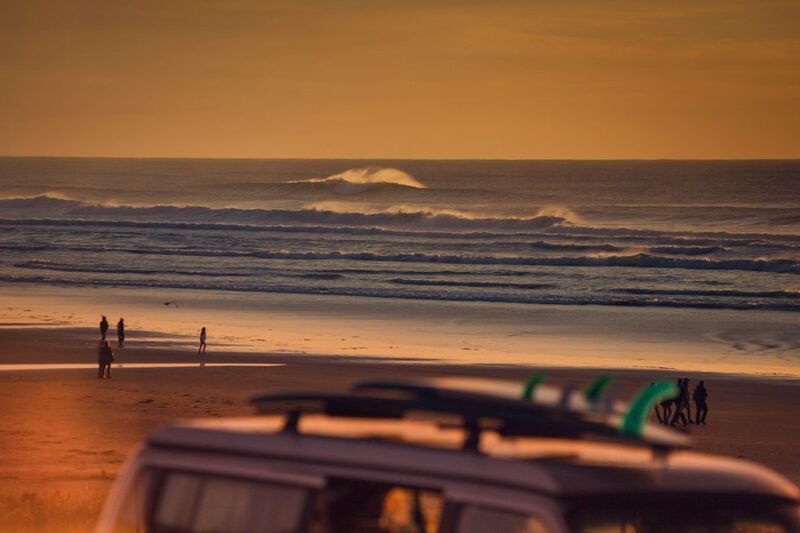 Cape Kwanda offers one of the most popular surf beaches on the Oregon Coast so make sure to rent a wetsuit and board and jump into the waves. This beach also happens to be where the Pacific Dory Fleet launches their boats directly from the beach and speeds out through the massive breakers, truly a site to see. The giant sand dune is worth a walk to the top for amazing views and if you are up for a thrill take a sand board back down. When you get hungry or need a beer, the Pelican Brewery located beachfront serves up a rich bowl of clam chowder and a tasty IPA. If you are looking to stop here for the night, Cape Kwanda RV resort has 120 camp sites and Webb County campground has 37 sites. A great stop on your way to Lincoln City is Cascade Head. This wild, foggy headland north of Lincoln City won its name from the many cascades that pour off its cliffs into the ocean. The trails to wildflower meadows here also have views of craggy arches, the Salmon River estuary, and a cove of barking sea lions. This is a great area to spot elk as they are often lounging in one of the many open meadows. The Otis cafe, located on the Salmon River, is a great place to stop for a home cooked meal. Lincoln City is the largest city on this route, and naturally you’ll see that it’s a bit more commercial than any of the others. You’ll find that many of the coastal cities are home to a range of artists with multitudes of mediums for expression, such as glass blowing. Every year from mid-October through Memorial Day, Lincoln City places hand-blown glass floats on the beach for you to find! They call it Finders Keepers and it supports local artists of Lincoln City and Pacific City with the treasure hunting game. In June don’t miss the Summer Kite festival where expert kiters gather from all around to show off their fancy kites. A couple of restaurants to check out in the area, the Wild Flower Grill for a hearty breakfast or the Hearth and Table for fresh, local fare and baked-to-order pizzas. If you are looking for camping in the area Devil’s Lake State Recreation Campground has 100 sites available. The drive back to Portland from Lincoln city is about 2.5 hours. If you have the time, we recommend stopping thru wine country in the Willamette Valley to visit a few wineries and to pick up a bottle of Oregon’s finest Pinot Noir. If you are not ready to end your trip just yet and have another day, head to Silver Falls State Park to camp and hike the trail of ten falls.